Amaryllis belladonna, (Jersey lily, belladonna-lily, naked-lady-lily, March lily) is a plant species native to Cape Province in South Africa but widely cultivated as an ornamental. It is reportedly naturalized in many places: Corsica, Portugal, the Azores, Madeira, the Canary Islands, Zaire, Ascension Island, Australia, New Zealand, Mexico, Cuba, Haiti, the Dominican Republic, Chile, California, Texas, Louisiana, and the Juan Fernández Islands. In South Africa the plants are found growing among rocks. ^ Linnaeus, Carl (1753). Species Plantarum. 1. p. 293 – via Biodiversity Heritage Library. ^ a b c RHS 2015. ^ a b c d e Phipps 2011. ^ "Amaryllis belladonna". Kew World Checklist of Selected Plant Families. ^ "Amaryllis Belladona distribution map". 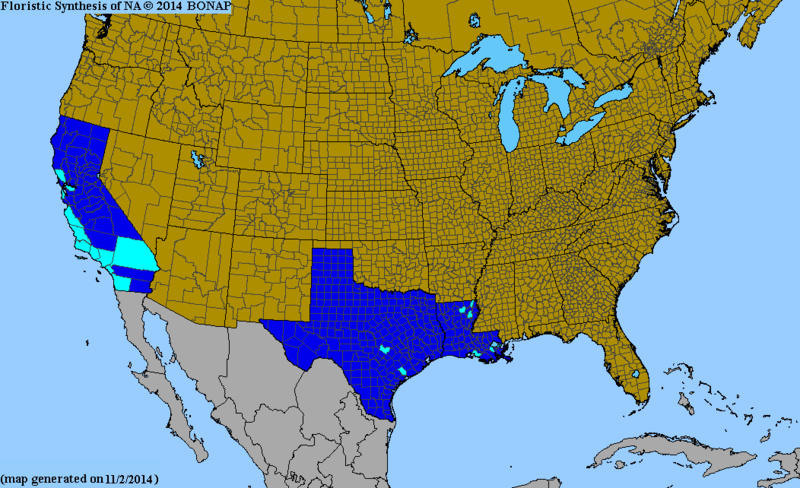 Biota of North America Project. ^ "Search for Amaryllis". World Checklist of Selected Plant Families. Royal Botanic Gardens, Kew. Retrieved 1 February 2015. RHS (2015). "Amaryllis belladonna: belladonna lily". Retrieved 1 April 2015. Dressler, S.; Schmidt, M. & Zizka, G. (2014). "Amaryllis belladonna". African plants – a Photo Guide. Frankfurt/Main: Forschungsinstitut Senckenberg. Carter, Kathie. "Amaryllis. Amaryllis belladonna (Brunsvigia rosea) and Hippeastrum hybrids" (PDF). Center for Landscape and Urban Horticulture. Cooperative Extension/Botany Plant Sciences Dept. University California Riverside. Retrieved 24 January 2015. Phipps, Nikki (9 February 2011). "Amaryllis Belladonna Planting – How To Grow Amaryllis Bulbs". Planting Flower Bulbs. Archived from the original on 24 January 2015. Retrieved 1 April 2015. Adams, T. (2001). "Amaryllis belladonna L." Plantzafrica. South African National Biodiversity Institute. Retrieved 2 April 2015. 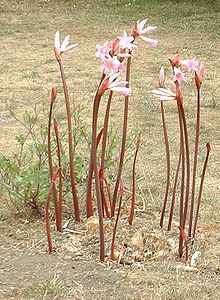 Wikimedia Commons has media related to Amaryllis belladonna.